Uma Thurman has shared video footage of a vehicle accident on the set of 2003 theatrical blockbuster, Kill Bill. Thurman claims he told director Tarantino she was uncomfortable driving the 1997 Karmann Ghia convertible while on location in Mexico. Thurman says she requested a stunt double for the shoot but that Tarantino denied her request and forced her to drive the vehicle herself to get the hair motion just right. According to Thurman, Tarantino was insistent, saying, "Hit 40 miles per hour or your hair won't blow the right way and I'll make you do it all over again." "But that was a deathbox that I was in," Thurman stated. "The seat wasn't screwed down properly. It was a sand road and not a straight road." The footage from a rear-mounted camera in the Karmann Ghia which the actress posted appeared to show Thurman speeding down the road before the car began swerving before slamming into a tree. In the video, you can see Thurman's head was thrown against the dashboard before she fell backward after impact. Tarantino can be seen in the video offering water to the actress after the incident and then she was carried from the scene by a member of the film crew. "When I came back from the hospital in a neck brace with my knees damaged and a large massive egg on my head and a concussion, I wanted to see the car and I was very upset," said Thurman. "Quentin and I had an enormous fight, and I accused him of trying to kill me. And he was very angry at that, I guess understandably, because he didn't feel he had tried to kill me." 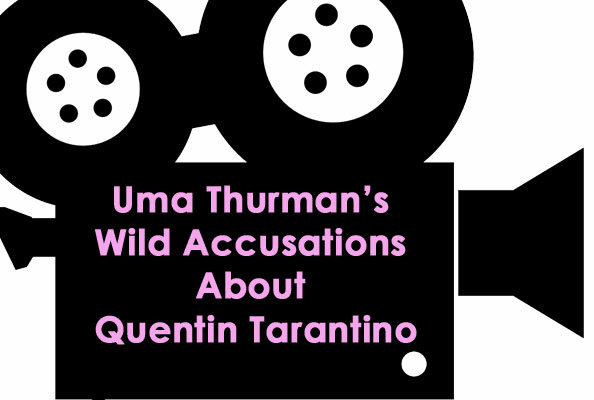 Thurman accused Tarantino of other abusive practices including spitting in Thurman's face for one scene and choking her with a chain in another. Tarantino and Thurman had also worked together on the 1994 mega-hit, Pulp Fiction, a film which propelled Tarantino into the upper echelon of Hollywood directors. Thurman described working with Tarantino as "a horrible mud wrestle with a very angry brother". She ony continued to act under his direction, Thurman claimed, because of the "greater good". Thurman has since received support from fellow actors Jessica Chastain, Asia Argento and Judd Apatow.